Jumping rope is a full body workout that will burn a lot of calories and get you in excellent fitness shape. Jumping rope for 10 minutes gives similar cardiovascular benefits as swimming for 20 minutes or jogging for 30 minutes. The type of jump rope you need depends on what kind of jumping you'll be doing. Speed jump ropes are made from a thin vinyl cord. They are best for indoor use, because they will wear down fast on the concrete or other harsh surfaces. They are easily adjustable by tying a knot in the rope below the handle. The speed rope is much lighter and faster than a bead rope, but the thin cord is more prone to tangling. The speed rope is often used by boxers and other athletes in serious training, because it allows the highest number of turns per minute, and the result is an intense workout with a lot of calories burned. The light, thin cord also allows performing crossing moves, multiple “unders” (the rope swings under the feet multiple times in one jump) and speed jumping. This rope can turn five to six times per second, and is used to break many U.S. and national speed records. The leather jump rope is slightly heavier than the vinyl speed rope. It often has wooden handles, and the cord is thicker. It tangles less than the speed rope. The leather rope is very popular because of its comfortable weight and because it makes less noise than the bead rope. The leather jump rope and the speed rope are available with optional weighted handles. The cloth jump rope slides on the floor surface easily, rather than bouncing like the beaded or speed rope. The cloth rope is made in many visible colors and suited for exhibition and competitions. The disadvantage of the cloth rope is that it gets dirty easily, and it does not last long on harsh surfaces. Its light weight can make it difficult to twirl as the rope is easily deformed by a breeze or when hitting an uneven surface. The cloth ropes are very popular for double dutch jumpers. 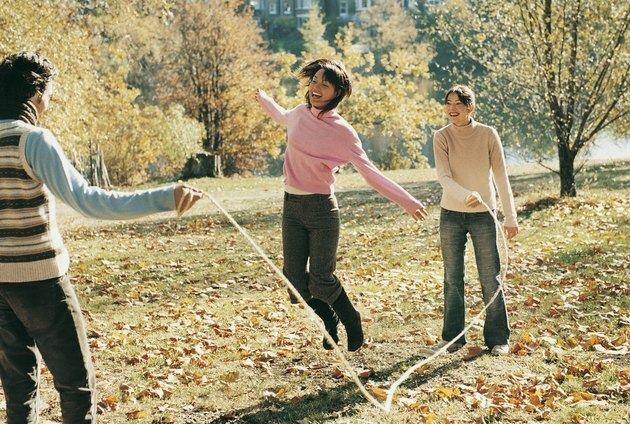 Double dutch jumping style uses two jump ropes that are turned by two people, while one or more persons are jumping. The double dutch ropes are much longer than regular one-person jump ropes, ranging from 14 feet up to 60 feet for multiple jumpers. There are three kinds of double dutch ropes: beaded rope that is very durable, provides excellent control and is easy to turn; cloth rope, that is very soft and easy to control; and licorice rope that is used for competition speed jumping. The jump ropes for children need to be shorter than adult ropes. It is the best to start with a beaded rope, because they don’t tangle as easily . Make sure that the rope is not too short, or it will lead to too many errors and the child may get discouraged. What Kind of Goggles Do Olympic Swimmers Use?